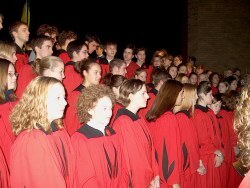 The YRHS Concert Choir has been invited to participate in a Mass Choir on Parliament Hill during the Canada Day Celebrations, July 1, 2004! The Raider Choir will represent Saskatchewan at this national event! Congratulations Mrs. Jemieff and Concert Choir! 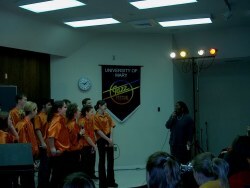 The University of Saskatchewan Greystone Singers performed a concert during the February Break. 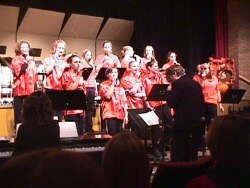 Congratulations to Reid Jemieff, Diana Jemieff and Erin Dramnitzki who are members of this choir. 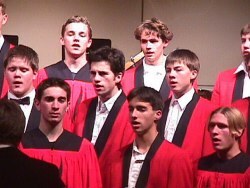 Thanks to all those who attended the excellent concert and those who provided billets. The Winter Concert is scheduled for this Sunday, December 8th at 2:30 p.m. Full concert uniform to be used......join us for an afternoon of Christmas music. Concert Choir performed for the YRHS Remembrance Day Services (2) on Friday, November 8th. 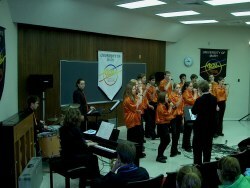 Vocal Jazz travelled to the University of Mary Jazz Festival - January 24th with a concert stop at Melville. Concert Choir had a clinic Mrs. McLary of Estevan for Wednesday, February 6th. The Choirs performed at the Yorkton Music Festival - March 7th with a YRHS Choir being recommended to the Provinical Music Festival.....Good job choirs and Mrs. Jemieff!